The family pet holds a very special place in our heart. Whether it is the dog, the cat, or a goldfish won at the fair, we love them to the moon and back. Years ago, when people would go on vacation, it was the neighbor or a pet-sitter who was talking care of Fido. Now, however, vacation destinations cater to pets of all types. From hotels and restaurants to parks and retail shops, pets are welcome like never before and many locations are promoting this expanded amenity. One of the best examples of this is the Portola Hotel & Spa, who welcomes four-legged friends from near and far. The hotel offers a variety of V.I.P. 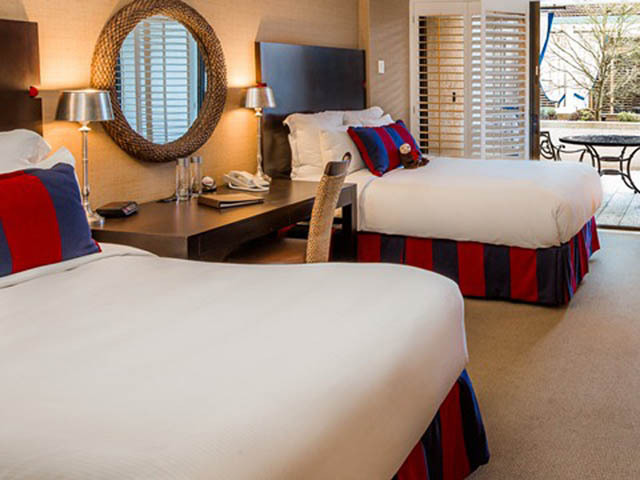 Pet perks including special pet dining areas, welcome treats and a guide to pet activities on the Monterey Peninsula. Pet spa services, doggy daycare, pet walking, sitting and vet services are available nearby. 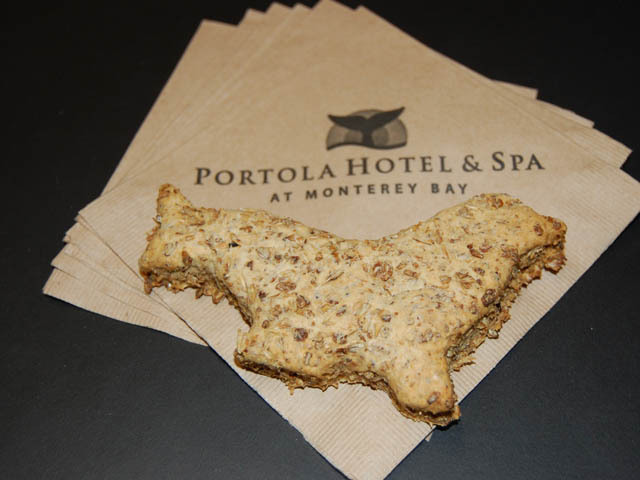 Not only is the Portola one of the most pet-friendly places around, but its two restaurants, Jacks Restaurant & Lounge and Peter B&apos;s Brewpub also love guests of the pawed variety. Both offer comfortable, pet-friendly patios with plenty of space for your pooch to stretch out. After resting and relaxing with your furry friend, how about taking in all the fun and fantastic things to do with your pet? Carmel-by-the-Sea is the place to start as it was recently named one of the most dog-friendly towns in America. Carmel Beach is a great place for a walk, with dogs allowed off leash and if you are in the mood for a bit of shopping, many of the businesses in downtown Carmel offer doggie treats and water dishes to keep your pooch happy and content. Carmel really has gone to the dogs as the Carmel Plaza also offers the Fountain of Woof among many other things for pets to do. Another great option for pets is the Coastal Recreation Trail that runs from Pacific Grove to Moss Landing. The paved path is great for walking or jogging with your dog or riding your bike with your cat. Just off the trail is the Monterey Dog Park. The park is about a block from the beach and across the street from Dennis the Menace Park. It offers separate areas for small and large dogs with water available. While dogs are required to stay on leash on the Rec Trail as it is called, they can run free on the white sand beaches of Asilomar State Beach. 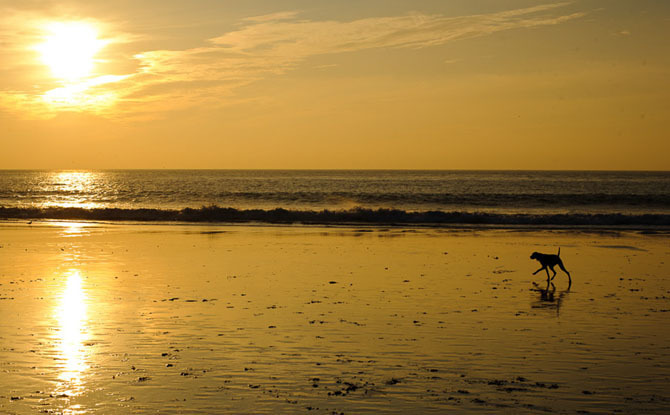 The long and wide beach gently slopes to the water and offers plenty of space to run and meet other dogs. Many other shopping districts are embracing the pet-friendly movement with several businesses in Downtown Pacific Grove offering biscuits, treats and water and the entire Del Monte Shopping Center welcoming dogs of all sizes with pooch-centric activities all year long. Garland Ranch Regional Park is also a great option for voice-trained dogs with multiple trails for the beginning to advanced hiker. 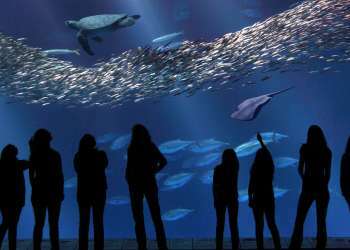 So if you are looking for the type of vacation that includes the two and four legged members of the family, look no further than the Monterey Peninsula. The views are spectacular, the activities fun and the memories unforgettable for you and your furry friend. 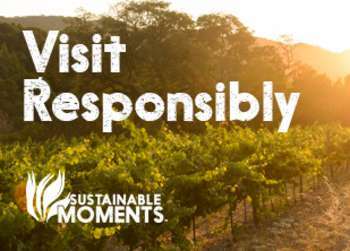 Click here for more pet-friendly activities.